A very fine feature debut, barely over an hour, but making intelligent use of opening titles to fill us in on the characters' backgrounds so that Noyce can quickly move his story forward. Noyce makes good use of the claustrophobic setting of the car to make us feel as though we're participants in the action, whether the camera is focused on the passengers squeezed into the back seat, or looking at the side of the driver's face during extended, and apparently partly improvised, conversation. Indeed, the titles give collective credit to the writer, actors and director, suggesting that there was something of the collaborative spirit of Alain Cavalier's Le Plein de super at work -- and the road movie format again allowing for the easy integration of a series of picaresque adventures that gradually take a darker turn. 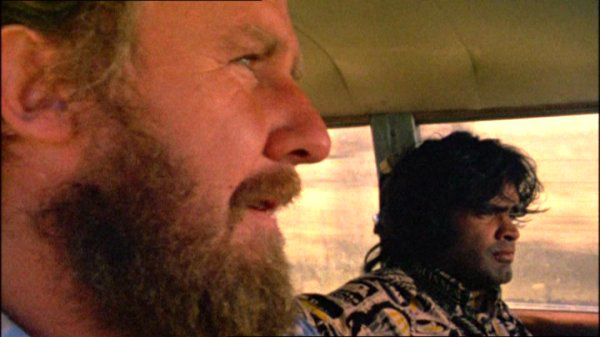 Several extended sequences are filmed on an Aboriginal reservation, and have a documentary feel, observational without being judgmental and reminiscent, at times, of the music-playing scenes in Barbara Kopple's great film of Appalachia, Harlan County USA, made around the same time.